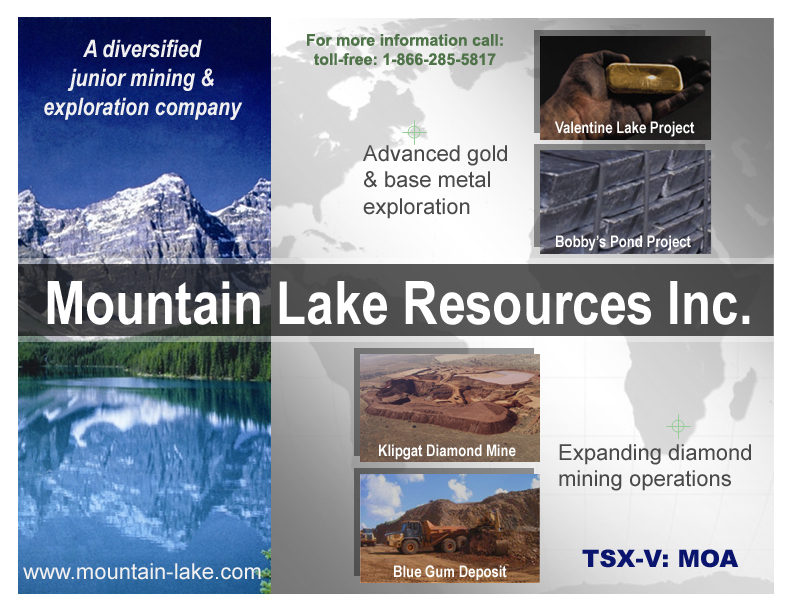 •	Bobby’s Pond, an advanced VMS base metal exploration property, formerly owned by Inco. •	Valentine Lake, an advanced gold exploration property, formerly owned by Noranda (Falconbridge). •	Etruscan Diamonds (Pty) Ltd., a joint-venture with Etruscan Resources Inc., mining alluvial diamond deposits in South Africa. Mountain Lake owns a 100% interest in the Bobby's Pond property, located in Central Newfoundland approximately 18 kilometers (kms) south of the past producing Buchans zinc mine and some 30 kms west of Aur Resources’ Duck Pond mine/mill development. The property hosts volcanogenic massive sulphide (VMS) mineralization and a NI 43-101 compliant mineral resource estimate, dated March 29, 2006, calculated an indicated resource of 380,000 tonnes of 4.73% Zn and 0.85% Cu + Pb-Ag-Au values, and an inferred resource of 555,000 tonnes of 4.12% Zn and 0.80% Cu + Pb-Ag-Au values, in the main zone. The main zone is not exposed at surface and there is good potential for the discovery of hidden VMS base metal mineralization along the traces of other EM conductors in the area. Further potential for the discovery of additional Cu-Zn-Pb-Ag-Au mineralization exists northeast, southeast, and southwest of the main zone, within the boundaries of Mountain Lake's Mineral License 4881, where exploration targets have both geological and geophysical characteristics similar to the main zone. The NI 43-101 technical report completed in March 2006, by Roscoe Postle Associates, recommends Mountain Lake continues to infill drill and test the extensions of the main zone. The Company expects to start an l,800 meter infill diamond-drilling program this August, which will be followed by a 3,000 meter exploration drill program that has been designed to increase the tonnage of the current resource by testing for additional mineralized zones along the northeastern and southwestern extensions of the main zone. Mountain Lake currently owns 50% of the Valentine Lake property and has an option to acquire the other 50% from Noranda (Falconbridge) by carrying out $2,500,000 in exploration work by October 31, 2007. In November 2003, Mountain Lake entered into a third party option agreement with Richmont Mines Inc. (“Richmont”). The option gives Richmont the right to acquire a 70% interest in the Valentine Lake Property from Mountain Lake by carrying out the required $2.5 million in exploration work by October 31st, 2007. Richmont is the operator of the project and as of December 31st, 2005, Richmont had incurred $1.4 million in exploration expense. Noranda (Falconbridge) retains a 2% NSR for base metals with 1.5% on the first 250,000 oz. of gold, increasing at that point to 3%. The Valentine Lake property is located approximately 55 kms south of the town of Buchans in Central Newfoundland. The Valentine Lake Zone, or “main zone”, hosts a NI 43-101 compliant inferred mineral resource of 1.3 million tonnes grading 10.50 grams per tonne (g/t) gold. Cutting assays to 58 g/t gold, the average grade is 8.51 g/t gold, for a total estimated mineral resource of 359,000 ounces of gold. The main zone is situated at approximately kilometer 1 of an overall geological structure that has been delineated by soil geochemical surveys to extend for 25 kms in a north-easterly strike. Mountain Lake demonstrated the exploration potential of the strike length with a preliminary drill program carried out some 13 kms northeast of the main zone, which returned 30.87 g/t gold over 1 meter, 5.55 g/t gold over 5 meters, 3.46 g/t gold over 4 meters and 3.61 g/t gold over 3.3 meters. The strike length remains largely under-explored. The principals of Richmont Mines and Mountain Lake are scheduled to meet in early-June. Discussions will include the results from recently completed metallurgical bench cyanide tests carried out by LTM Laboratory to determine the gold grade recoveries, and the next phase of work on the Valentine Lake project. Mountain Lake owns 25% of Etruscan Diamonds (Pty) Limited (“Etruscan Diamonds”), a joint-venture corporation with Etruscan Resources Inc. (“Etruscan Resources”), formed to pursue alluvial diamond mining operations in South Africa. Etruscan Diamonds, which originally held the rights to seven alluvial diamond-bearing properties, now holds a dominant land position in the Ventersdorp District and Mooi River Valley alluvial diamond areas of South Africa. Etruscan Resources is the operator of the joint-venture. Production continues at the Klipgat Alluvial Diamond Mine located in the Mooi River Valley. Operations from June 23, 2005 through February 28, 2006 resulted in a total of 7,657.65 carats being recovered with an average grade of diamondiferous gravel treated of 2.03 carats per 100 cubic meters. Diamond sales for the period yielded an average price per carat ranging from US$411.42 to US$505.00. In mid-April, a bulk sampling program commenced at the Blue Gum deposit located in the Ventersdorp Diamond District. Etruscan Diamonds drilled a portion of the deposit outlining 22 million cubic meters of diamondiferous gravel and a total of 250,000 cubic meters was taken for processing from six different areas of the outlined gravel package. Processing of the bulk sampling continues, with the objective being to determine the grade of the diamondiferous gravel in preparation for a NI 43-101 compliant mineral resource estimate. Gothoma Diggings CC (“Gothoma”) of South Africa is the contract miner at both the Klipgat and Blue Gum deposits. Gothoma pays all costs associated with mining operations at Klipgat in return for 70 to 85% of diamond sales revenue depending on the value of diamond sales in each quarter. Gothoma pays all costs associated with the Blue Gum bulk sampling program and will receive 85% of the diamond sales revenue. Etruscan Diamonds’ mining operations comply with Black Economic Empowerment (BEE) guidelines in South Africa. Mountain Lake’s portion of the royalties from diamond sales revenue is currently being used to finance the expansion and development of the diamond operations in South Africa.